High Strangeness: Alien Invasion Confirmed! Well, this news ought to make some people happy. 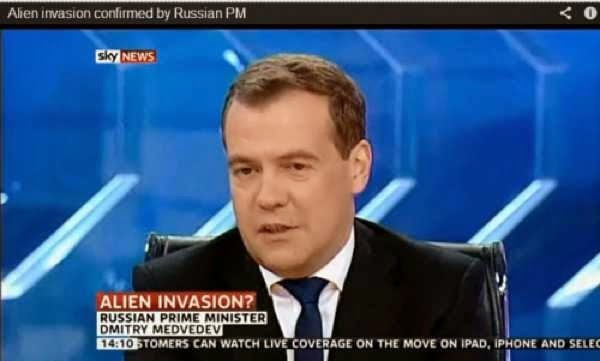 According to a news story just sent to me by my son's girlfriend Sxxxxxxx, Russian Prime Minister Dmitry Medvedev recently warned President Obama that if he doesn't go public with news of an alien invasion, he will! February 11, 2015 - A stunning Ministry of Foreign Affairs (MFA) report on Prime Minister Medvedev’s agenda at the World Economic Forum (WEF) this week states that Russia will warn President Obama that the “time has come” for the world to know the truth about aliens, and if the United States won’t participate in the announcement, the Kremlin will do so on its own. Okay, so the news is two months old already, so sue me. I just found out about it today and I am profoundly concerned about this. I read on with great interest, hoping for clarification. Just what is President Obama keeping from us? Why is he in cahoots with the Kremlin on this? And what could have caused Medvedev to bust loose and suddenly make an issue of this on the eve of the important WEF gathering? Which is it: "Invasion" or "Invasion?" In this case, the reference to the movie "Men In Black" is about a documentary film of that name, not the beloved Will Smith/Tommy Lee Jones Hollywood movie extravaganza. Come to think of it, that film pretty much proved that our planet is teeming with aliens that the government can barely keep track of, much less contain. Anyway, I am shocked and intrigued by everything about this story. If you look closely at the video capture at the top of the story, the Chyron clearly says "Alien Invasion Confirmed by Russian PM." And in his 2012 comments he says there's a "secret service that exercises control over aliens on the territory of our country," and that if he divulged how many aliens he was actually talking about "it may cause panic." Seems pretty clear-cut to me: the aliens are here, and they intend to kick our asses. And yet, despite the fact that this news broke two months ago, neither President Obama nor Minister Medvedev have, that I'm aware of, gone public with what they know about the aliens among us. The aliens are coming, folks -- no, they're here! -- and our leaders are doing jack about it!! And, Mr. Obama, are you really going to let the Russians make this announcement to the world?? The Russians? Remember Sputnik? Remember Yuri Gagarin? Are you really going to let them do it to us again?